The 10 Best Breweries in Mississippi! The craft beer scene is growing in popularity across the country. Here in Mississippi, we have a number of microbreweries all coming up with exciting innovations in the art of beer-making. Learn more about these breweries, then drop in for a tour to support your local favorite! Named for an island off the coast of Mississippi, Chandeleur Brewing is quickly making a name for itself along the Gulf Coast. Enjoy tours Thursday-Sunday, complete with complimentary beer tastings. They specialize in blends with a beachy touch, like Curlew's Coconut Porter and Surf Side Pineapple Wheat Beer. Natchez's first brewery is doing so well, they've already had to expand into a new building. In addition to year-round offerings such as the “Bluff City Blonde” and “Alt-ered State” (a German-style amber), they also offer seasonal brews including “Delta Shadow,” a Black IPA. The Biloxi Brewing Company is helping the Gulf Coast make a name for itself in the craft beer world, and the brewery pays homage to its home by featuring the Biloxi Lighthouse on its logo. Try the Black Gold Breakfast Blend, which is aged on coffee beans, and the popular “Biloxi Beach Blonde,” which is on tap at a number of local bars. Yalobusha Brewing Company, or Yalobrew, is located in Water Valley in the historic Hendrick's Machine Shop, which was built in 1860. 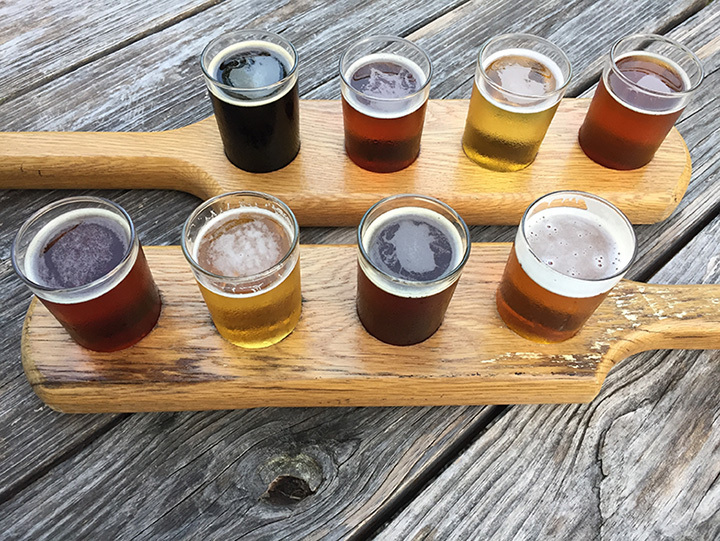 Yalobusha Brewing offers four brews year-round as well as a rotation of seasonal and experimental beers, and the taproom is open Fridays and Saturdays for tours. A relative newcomer, Mississippi Brewing is making a splash in Gulfport with its Courage Pale Ale, “Red Headed Step Child,” and Southern Light Blonde Ale. First a brew pub, then borrowing the production facilities of Biloxi Brewing Company, this nano-brewery is sure to be a big player in the future. Lucky Town Brewing Company in Jackson is the kind of place that celebrates beer with a spirit of fun. With names like “Hop Fiasco” (an American IPA) and “Flare Incident” (an oatmeal stout) and beers rated on an “Awesome Level," you know you're going to like this place before you ever taste the beer. Lazy Magnolia is the oldest brewery in Mississippi. They've been serving the state since 2003, and their beer can now be found throughout the Southeastern U.S. Their most popular brews are Jefferson Stout, a Sweet Potato Cream Stout, and Southern Pecan, a toasty Brown Ale made with pecans. However, they have such a wide selection that you're guaranteed to find the perfect beer for you. Slowboat Brewing Company epitomizes passion for craft beer. By preparing smaller batches, they are able to focus on quality and creativity. The owners started as homebrewers and have turned their love into a business with Slowboat. Try “Into the Mystic,” with fruity complexity and a delicate pink flavor, and “Dairy of a Madman,” a creamy Vanilla Milk Stout with hints of chocolate and coffee. At Southern Prohibition Brewing, it's not enough to make great beer—which they do. The team at SoPro is constantly pushing themselves to come up with new ideas and improve on what they've already put out, such as the Devil's Harvest Breakfast IPA, formerly an American Pale Ale. And the can art on their offerings is nearly as impressive as what's inside! Mayhew Junction Brewing Company was started in Starkville by a group of friends with a common love for good beer. All of them bring their own tastes to the craft, creating a perfect balance. The team believes that what makes a good brew is passion for the craft, and they are obviously doing something right, because their events draw a crowd! View more Mississippi Breweries and Brew Pubs.